I am a huge fan of digitized online books. Google Books, the Internet Archive, Project Gutenberg, Hathi Trust Digital Library, Making of American (Cornell University and University of Michigan), FamilySearch Books, and HeritageQuest (available through participating libraries) are all resources I use quite regularly in my genealogical research. 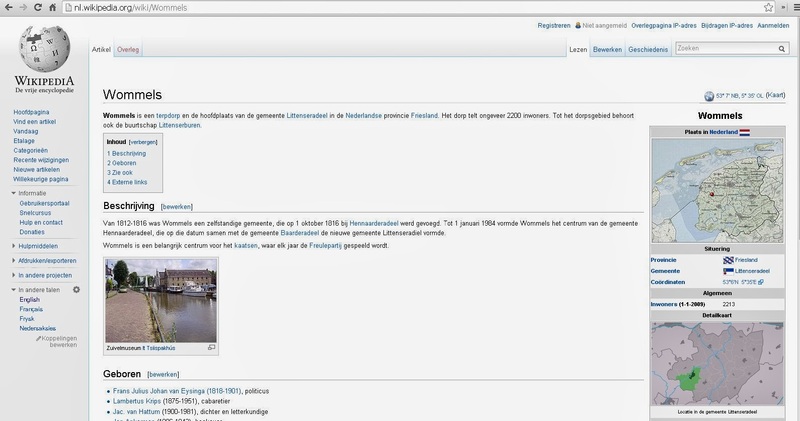 Imagine my surprise when I discovered yet another digitized online library, highlighting the digitized books, newspapers, magazines, and radio bulletins of the Netherlands! 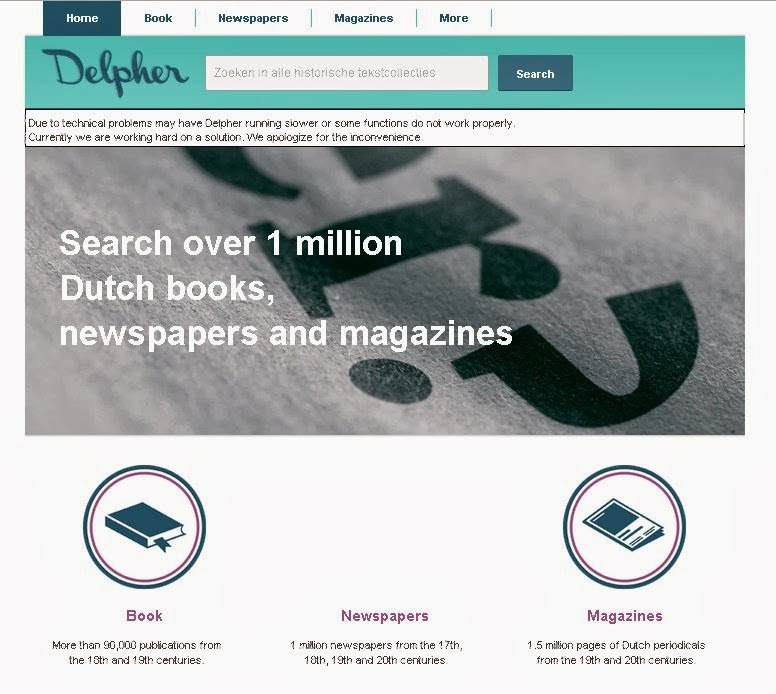 This is Delpher, a source for all researchers using historical sources. The English translation of the purpose of the website lists that it is for scientists and journalists who want to expand their research a step further, for genealogists who search for undiscovered pieces of family history, and for students working on their theses. 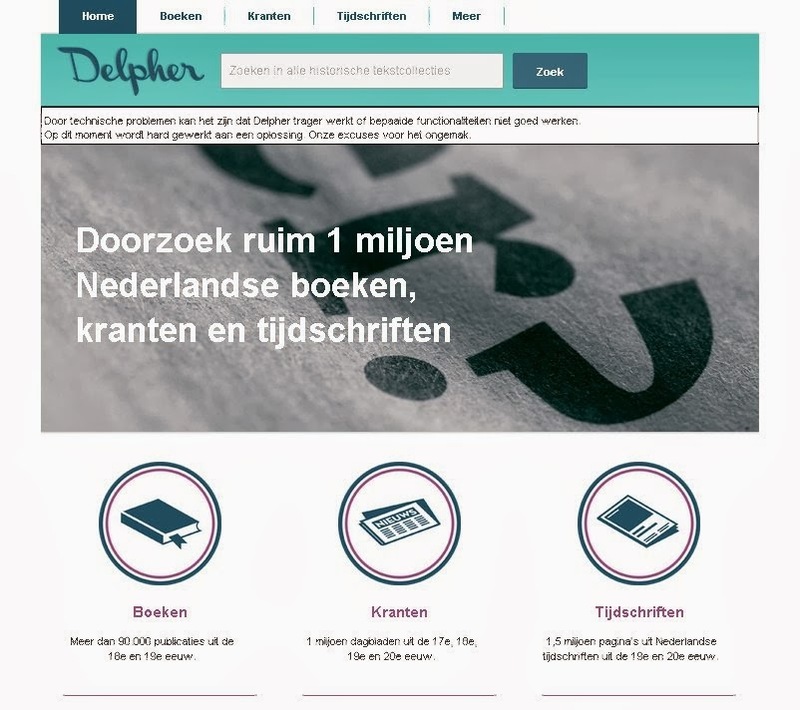 If you don't have Chrome, you can go to Google Translate and enter the URL for this site, http://www.delpher.nl. It will bring up this page, translated into English from Dutch. The first thing I wanted to check out was their books, which I accessed via the Book/Boeken icon under the header. There is also a tab at the top of the page. There is the Basic Books Collection and the Google Books Collection. The Basic Books Collection is a "combined offering of books from the special collections of the university libraries of Leiden and Amsterdam and the Royal Library. You will find over two million pages from more than 11,000 old prints from the Dutch-speaking region from the period 1781-1800. It consists primarily of historical, political, theological and literary works." This collection is held on the website. The Google Books Collection is held on the Google Books site, but can be searched and accessed from Delpher. It consists of 80,000 of the first 160,000 copyright-free books from the eighteenth and nineteenth centuries digitized from the Royal Library. There "is a wealth of information at your disposal. The subjects of the books are very diverse; both fiction and non-fiction has been included in the offer." Keep in mind that most of these books are in Dutch (and other non-English languages). However, as a genealogist, this site is useful in searching names and locations for genealogical and historical purposes. 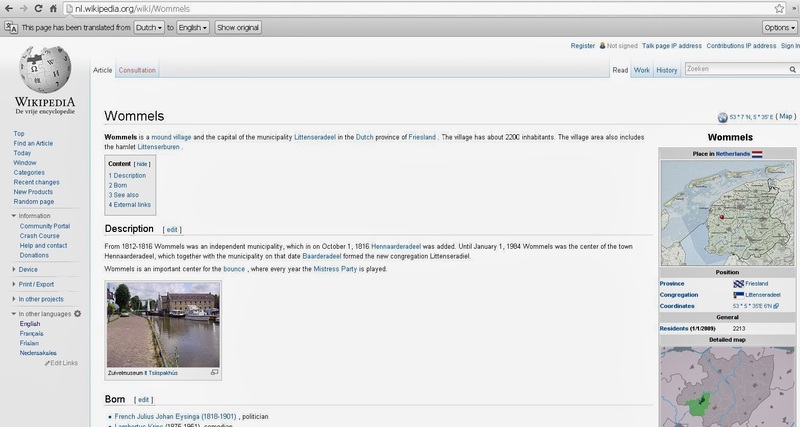 Once a search result is found in the book, you can choose the Text/Tekst tab on the right side of the display. This text can then be copied and pasted into Google Translate. I plan on learning the history of many of my Dutch ancestral locations this way. The digitized newspaper collection ranges from 1618 to 1995. The English translation of the description of this collection states: "Dig into the past with old newspapers from the Dutch East Indies, Suriname, the Netherlands Antilles and the United States. [Historical news] in more than nine million pages of newspapers from the 17th, 18th, 19th and 20th centuries - including ones from the Second World War. View thousands of newspaper articles, news, advertisements, and family announcements." I found the Text/Tekst feature unhelpful in the newspaper collection. However, I could easily pull up Notepad and transcribe the article and translate it with Google Translate. What I did find helpful were lists of births, marriages, and deaths when I searched on Ferwerderadeel, an ancestral municipality. This definitely will be an area where I'll be searching for my ancestor's names, especially for emigration lists. Clicking on the Details tab gives me the source information (newspaper name, publication place and date, and page number) for citation information. Next, don't think the magazine collection won't be useful for genealogy. The description states: "Search full text of 1.5 million pages from 80 old journal titles that have appeared in the second half of the 19th century and the first half of the 20th century. You'll find a lot of (new) information in general, cultural, literary, religious, scientific, political, sporting and economic journals that are available. There are magazines for the general public, such as the Dutch Revue and Our Own Magazine, and there are journals, including the Journal Marine and Lawyers Journal." This collection is also a great way to learn about the cultural aspects of the Netherlands. Finally, under More, you will find radio bulletins: "View 1.5 million digitized typescripts from the 20th century (period 1937-1984). The ANP Radio Bulletins [collection] provides news every day, as it was read on the radio. Along with the digitized newspapers and magazines this collection provides an interesting picture of the new consumption then." I encourage you to check out Delpher, even if you don't have Dutch heritage. I did find a number of other European books in their collection. It's definitely a website worth adding to your digital library! The meaning of the surname SAYERS is diverse because the name can originate from a variety of languages and countries. In my family, our oral history states it is a Scots-Irish (or Ulster Scot) line. In other words, it is a family that originated in Scotland and settled in Ireland for many generations, before emigrating to North America. There is a Gaelic origin of SAYERS which is Mac Saoghair. This apparently is a patronym of the Old English personal name, Saeger, which meant Sawyer (an occupational name for someone who cut, or sawed, wood). This name has been difficult to search in databases because of its many spelling variations. Some of the more common ones include Sears, Sawyer, and Sayer. Using Soundex to search for this name brings up hundreds of results, making narrowing down likely candidates very difficult. Researching the SAYERS family was one of my early projects when I began doing genealogy. I was fortunate to come into contact almost immediately with distant cousins, mainly in Canada, who were also researching the family. We were able to exchange information and really expand the family tree of William SAYERS, Sr. and his wife, [--?--] GILLESPIE, although we have been stuck attempting to go back beyond this couple, due to lack of records in Ireland. I have even hired professional genealogists in Ireland to pursue this family line, but they were unable to do so. Ahnentafel #156 - William SAYERS (1758 - 1860) - my earliest known SAYERS ancestor, my 4th-great-grandfather, was born in Letterkenny, County Donegal, Ireland. 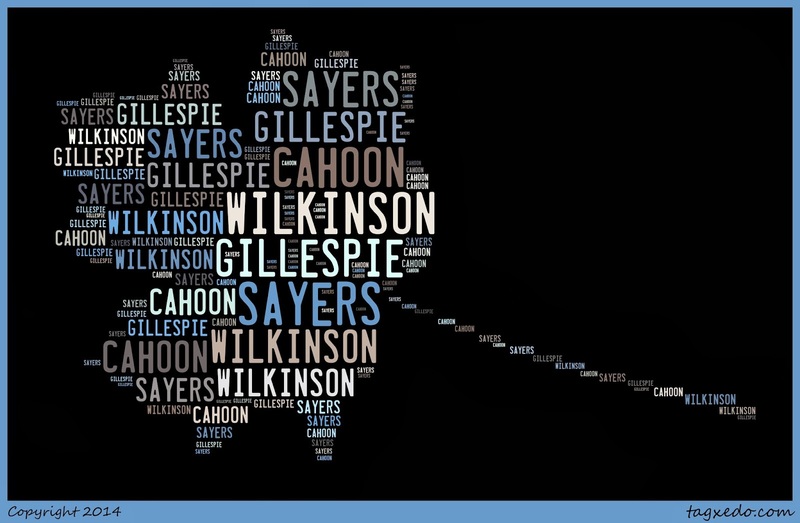 It is believed, but not known for certain, that his wife's surname was GILLESPIE, as they had a son with that name. The family belonged to the Church of Ireland, and declared themselves Anglican after they emigrated to Canada. William's five known children started emigrating to Prince Edward County (not Prince Edward Island) in what was then Upper Canada (now Ontario) in the late 1820s to late 1830s. I often think about how brave William must have been to be in his late seventies and board a wooden sailing ship to cross the Atlantic to his new home. He apparently lived near or with his son, William, Jr., in Hungerford Township, Hastings County, and appears in the 1861 mortality census as having died the previous year at aged 102. Ahnentafel #78 - John SAYERS (b. 1811) - he was born in Letterkenny, and as a single young man came to Prince Edward County, Upper Canada, probably with his sister Catherine and her husband Stephen MARTIN. The MARTIN family was one of the early prominent pioneer families in Prince Edward County and have been listed in Pioneer Life on the Bay of Quinte (see link below). In 1828, John was residing in Marysborough Township. He married Mary CAHOON in 1831 in St. Mary Magdalene Church in Picton. They had 11 or 12 children. In 1861 and 1871, they are farming in Cavan Township, Durham County. I cannot find a death record for either John or Mary, although vital registration began in 1867. Their deaths probably went unrecorded. I have other Ontario ancestors who did not have their deaths recorded for one reason or another. They do not appear to be enumerated on the 1881 census, but is difficult to determine for certain, due to spelling variations. Another possibility is that they emigrated to Michigan with a number of their children; however, no death records there have turned up for them. Ahnentafel #39 - Mahala SAYERS (1847 - 1937) - born in Prince Edward County, she married farmer and carpenter John WILKINSON in 1871 in Port Hope, Northumberland and Durham County. They had eight children (five born in Canada and three in the U.S.) and lived in the Port Hope and Cavan Township areas until about 1880, when they emigrated with a number of Mahala's siblings to Montague Township, Muskegon County, Michigan. By 1884, they had resettled in Whitehall Village, Muskegon County, where they lived until John's death in 1917. As a carpenter, he built numerous homes in Whitehall Township. In 1930, Mahala was living with her son, John, Jr., in Paris Township, Kent County, Michigan. Later, she lived with her daughter and son-in-law, Ella and Floyd LUCHINI, in Alma, Gratiot County, Michigan, where she died. Mahala was my grandfather's great-grandmother, and he remembers her as a small boy. One of the memories involves her running her finger down the length of his nose, saying, "Love is like this..." and then, running it back up, "...but marriage is like this." Ahnentafel #19 - Mary J. WILKINSON (1872 - 1940) - She was born in Port Hope, the eldest of eight children. She married George Emmett LEWIS (1868 - 1964) on 31 Dec 1891 in Muskegon, Muskegon County, Michigan. Like her father, George was a carpenter, and it is likely Mary met George if he worked for or with her father. For a short time, Mary and George lived in Cleon Township, Manistee County, and later in Blue Lake Township, Muskegon County, but they lived most of their lives in Whitehall Township, Muskegon County, particularly the Village of Whitehall with both Wilkinson and Lewis family members close by. Mary gave birth to 13 children, 11 of whom survived infancy. Her eldest child, George Richard LEWIS was tragically killed at the age of 20 in a motorcycle accident. Although Mary herself only lived to the age of 68, four of her children survived into their 90's, apparently inheriting her Great-Grandfather Sayers' longevity genes. 7. Pioneer Life on the Bay of Quinte, published in 1904, found at the Internet Archive. The SAYERS family's story is intertwined with the MARTIN's, which is on pages 579 through 585. Marie Lewis. C. Winter 1916-7. Muskegon Heights, Michigan. Original photograph privately held by Catherine M. Robbins, [ADDRESS FOR PRIVATE USE], Coopersville, Michigan. 2014. This is my submission for Sepia Saturday 212: Snow. This photograph features my paternal great-grandmother, Marie LEWIS, a couple of years before she married my great-grandfather, William Bryan ROBBINS. They would meet that fall, when Bryan would drive the hearse for her maternal grandfather's funeral. At four-foot, eleven-inches tall, Marie's petite figure and sparkling blue eyes would have been attractive to any young man. She waited for Bryan while he served in the American-North Russian Expeditionary Forces during World War I. They were married Christmas Day, 1919. As I looked at the Dutch Wikipedia page, Google Translate started translating it. 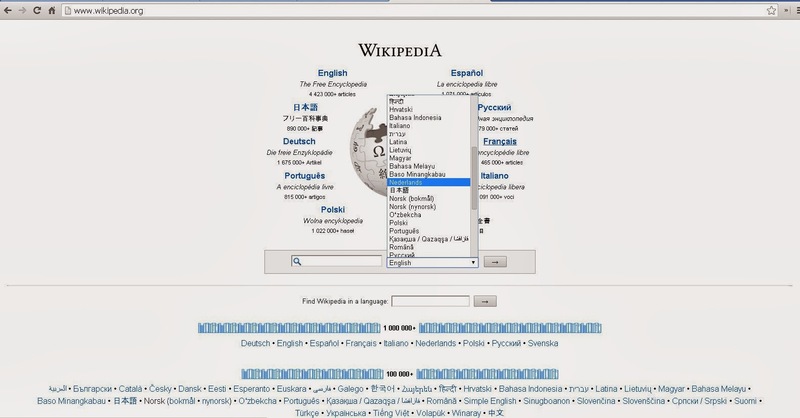 Google Translate is available automatically on your Chrome Browser. If you don't use Chrome, you can go to the Google Translate page and enter the URL of the page you wish to translate, and it will do so. What Shall I Take with Me to RootsTech and the FHL? 1) I've been reviewing all the research I've done on two of my brickwall ancestors, Jeremiah Franklin YORK and Berber J. DeJONG. Using my Repository Checklist, I'm building a list of books and films I want to peruse while I'm at the library. I've read some books on using the Family History Library, too. 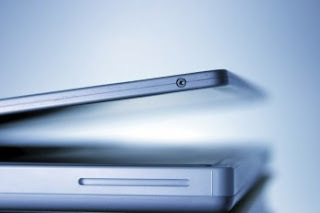 2) I'm taking stock of my technology, such as it is. I don't have the latest and greatest, and that's OK. I've learned with my limited budget that having the newest toy isn't necessary to do good research or have fun. Most importantly, it does not limit me from learning about the newest gadgets. I'm planning on taking a class on using iPads in genealogy, for instance, even though I don't own a tablet. I do have access to one in my classroom, so I'm somewhat familiar with that device. I just haven't felt the necessity of owning one yet. The technology I'm traveling with is a four-year-old Asus Eee netboook with Windows XP (yes, I know support for XP is going away) with Microsoft Office 2010, a Chrome browser, Evernote, Dropbox, and RootsMagic 6, among other programs and apps. I have an LG 800GHL Tracfone with limited apps (Facebook, Google Maps, and a mobile browser). I'll be bringing my chargers and netbook lock and a couple of flash drives. Finally, I have a Canon Powershot A550 digital camera. The camera on my phone is very poor quality, so I continue to use a digital camera, which works great, except for being a battery-eater. For that reason, I'm stocking up on batteries. 3. I registered for RootsTech on the first day registration was available, and signed up for a couple extra classes. Recently, I accessed the web app for my schedule and selected all the classes I want to take, as well as listed a couple extra "interests" in case those classes fill up before I can claim a seat. I tried for diversity in classes as well as speakers. There are some big name speakers I'd love to hear, some fellow geneablogging friends I've never heard present, and classes I'll take because of the interests I have or the challenges I'd like to try, even though I've not heard of some of the speakers. 4. I allowed myself some down time. I didn't see as many sessions on Saturday that I would like to attend. I may decide to sleep in and hit the library for one more research session that day. 5. I'm traveling light. I don't need to bring a heavy coat or boots, because a) I'll be staying at the Plaza not far from the conference venue and the library; and b) I'm an Inland Northwest girl; I know what cold and snow are like! 6. I'm frugal. I'll be packing instant oatmeal and snack items to save on my meals. 7. I'll be rooming with some genealogy friends who have had experience both in leading research groups at the library and have attended previous RootTech conferences. They will be excellent guides and advisers. 8. I hope to have fun! I'd love to meet up with other researchers and bloggers, and if I have time, see some of the sights in Salt Lake City! And I'm ordering some more business cards to hand out. So that being said, do you have any advice for me? I'm especially looking for those who have been to RootsTech and/or the Family History Library in the past. What do you recommend? 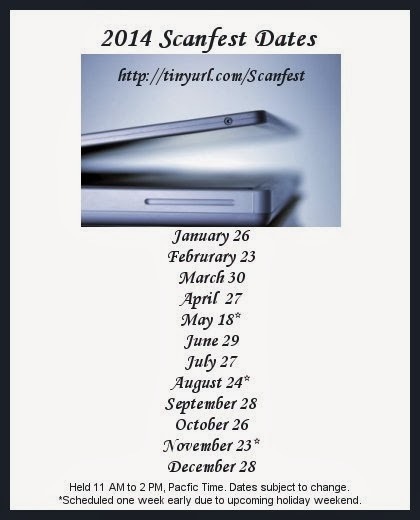 The January 2014 Scanfest will take place here at AnceStories this coming Sunday, January 26th, from 11 AM to 2 PM, Pacific Standard Time. 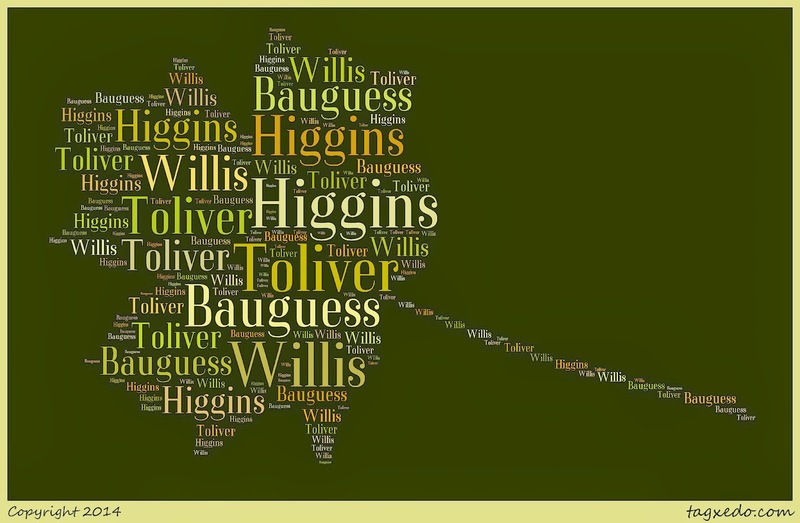 According to the Dictionary of Family Names, HIGGINS can have Irish or English roots. If Irish, it can be a variation of the Gaelic "Ó hUiginn," which means "a descendant of Uiginn," itself meaning "viking" or "sea-rover." It can also a variant of Hagan. If English, it can be a patronym of the medieval personal name Higgin, which can be a nickname of Hick. In writing this post, I realize I haven't researched this family very well. With all the new resources available online as well as having improved my research skills since I last investigated this line, it would be a worthy project to revisit. Ahnentafel #148 - John HIGGINS, Sr. (dates unknown) - he married Fannie BAUGGESS (b. c. 1773 in Loudoun Co., Virginia). They had six known children. Ahnentafel #37 - Matilda HIGGINS (1829 - 1906) - born in North Carolina, she married Jacob F. TOLIVER in 1851 in Ashe County. He served in the Civil War. They had five known children. Matilda and Jacob divorced by 1882, when he remarried. 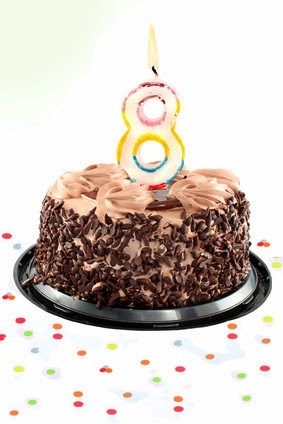 Today is my eighth blogiversary. Time flies when you're having fun! I think about the friends I've made through blogging, both fellow geneabloggers and my readers. I've had great opportunities because of blogging, too: traveling, free products to review, and some nice awards. Finally, I've made connections with others researching the same lines or locations. I've long been wanting to get back into blogging more frequently again. Each year, it's easy to make a New Year's resolution that I will do so, but blogging takes time: time to think, time to research, time to write, time to revise and edit, time to find links and images, and time to publish. We all have the same number of hours in each day, but I work longer hours than I did when I first started blogging, and I exercise more (at the height of my blogging days, I was extremely overweight, due mainly to my sedentary lifestyle). I try to do better research, too, and that often limits me in what I'm going to write. As I've become a better and more thorough researcher, I realize how time-consuming the fact-checking and source citing becomes, and yet, how necessary. 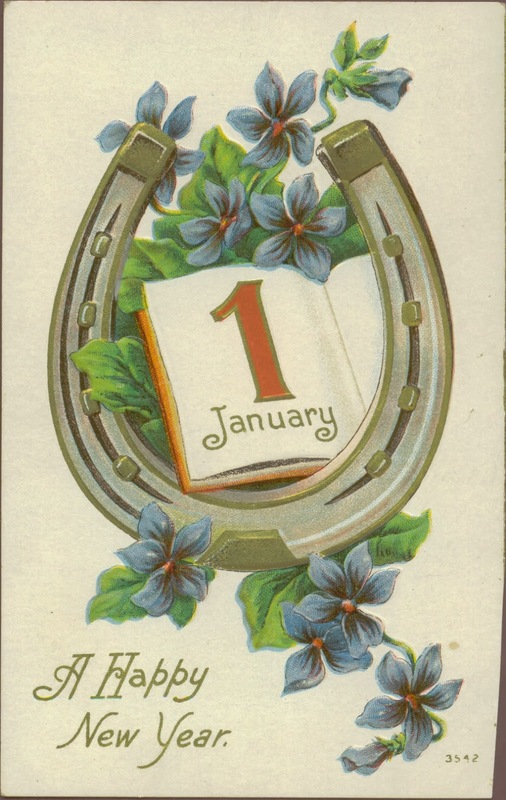 My goal this year is to publish a Tuesday's Tip post and a Surname Saturday post each week. The first is because that seems to be most popular with my readers, and the second is to reach out to connect with fellow researchers. I'll continue to host Scanfest once a month, and I aim to write one ancestor's story (AnceStory) per month. Will I succeed? I will do my best, but I won't beat myself up when I don't quite make it. I'm using my Genealogy Blog Post Planner, and not only does it help me plan WHAT to write, it helps me to plan WHEN to write. I thank each and everyone of you who has taken the time to read my thoughts, dreams, disappointments, and research goals and logs over the past eight years. You are a wonderful audience, and I appreciate you immensely. However, there are times when I would like to tweak my own list and sort the various fields to make them easier to plan research trips. I'm getting ready for RootsTech in a few weeks and am looking forward to my first visit at the Family History Library. I decided to make my own repository checklist in a spreadsheet and came up with the following. The different columns are headed: Surname, Given Name, Maiden Name (in case I need to search for those separately), Film & Item #, Call # (for books), Record type (film, book, CD, database), Description (as it appears in the FHL catalog), Collection (see next paragraph), Notes, Priority, Obtained (to be checked off), and Results. You have probably noticed that the Collections column is empty. That's because I just added it this past weekend, when I realized that the films and books I need to research belong to different collections and will be located on different floors of the Family History Library. To use my time efficiently, I may wish to research as much as possible on one floor before moving to another. I'll have to go back and add the information I need in the Collections column before my trip. Finally, I can use this handy repository checklist for more than one repository. Whether I'm researching in the genealogist's paradise--the Family History Library--or checking out resources in the Spokane Public Library's Genealogy Room, or perhaps the state's Eastern Washington Regional Archives out at Eastern Washington University in Cheney, I can utilize my checklist on my netbook, with Dropbox or Evernote, or Google Drive. For your own use, I've created a blank Repository Checklist form, which can be found online here and downloaded to your computer. You can then tweak it to suit your own needs. I hope this checklist, or at least the idea of it, is helpful to you in your research. Happy Hunting! Here's a handy poster to help you remember the upcoming Scanfest dates for 2014. Please remember that dates are occasionally subject to change, but I will do my best to maintain this schedule. Those marked with an asterisk will be held one week early, due to an upcoming holiday weekend (Memorial Day, Labor Day, and the American Thanksgiving, respectively). Times are Pacific Time. We are in Standard Time until March 9th, when we switch to Daylight Savings Time until November 2nd. 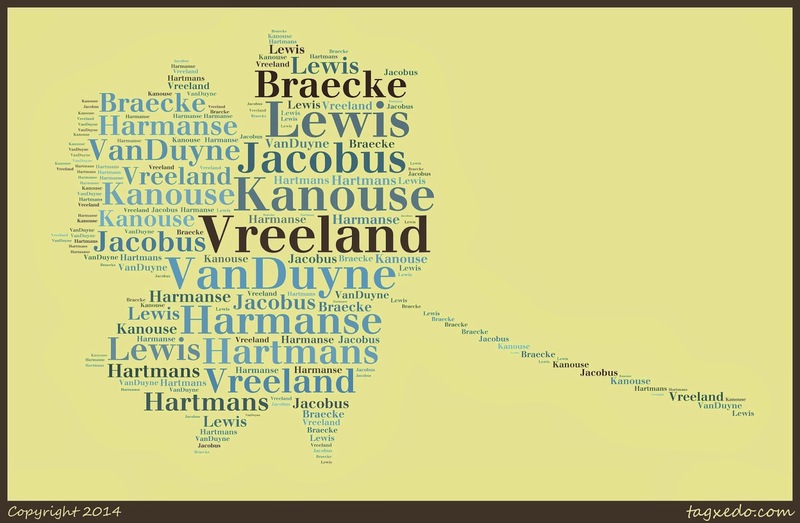 The roots of the name VREELAND are somewhat clouded. Our famed immigrant ancestor, Michiel Jansen VREELAND, may have, at one point, lived in Vreeland, Utrecht, the Netherlands, but no evidence so far has been found, other than deeply entrenched oral history. He first appears as Michiel Janez van Scrabberkercke, a colloqialism of 's Heer Abtskerke on the island of South Beveland, Zeeland, the Netherlands. He very probably lived--and may well have been born--here. He is later referred to in New Amsterdam church records as Michiel Jansen van den Berg, referring to the hill farm at Rensselaerswyck Colony (a tract of land surrounding current Albany, New York), where he first settled before removing to New Amsterdam (now New York City) in 1646. Ahnentafel #4736 - Michiel Jansen VREELAND (c. 1610 - 1663) - born in the Netherlands, he married FitjeHartmans (also known as Fitje Wessels; alternative spellings include Fitie, Fytje, Sofitje, and Sophia) (c. 1611 - 1697). In May 1638, Michiel and Fitje boarded Het Wapen van Noorwegan (the Arms of Norway) and sailed from Texel, the Netherlands, arriving about August 4 in New Netherlands (now the area of New York State and New Jersey). As a farmer, Michiel brought two farm laborers with him. The family joined a small group in the Rensselaerswyck Colony, where Michiel was head farmer for the Patroon, Killiaen Van Rensselaer, from 1640 to 1646, until his move to New Amsterdam. In 1647, the Director General of New Netherlands, Pieter Stuyvesant, and his Council chose Michiel and eight other men to give advice and assist in promoting the welfare of the colony. Michiel started raising horses in 1648. A rumor persists that he sold contraband munitions to the Indians (forbidden by Stuyvesant), and also was fined for selling beaver skins without paying duty (taxes). He made a fortune in the trapping grade. In 1654, Michiel moved to Pavonia, the area of New Netherlands that is now New Jersey and corresponds with the current Bayonne-Jersey City area. The following year, on September 15th, the Native Americans raided the settlers. Michiel, Fitje, and their six children were the only family to escape completely unharmed, which may lead credence to the rumor that he sold munitions to the natives. However, he did lose his house and all his possessions. They returned to Manhattan and there on October 23, 1656, Michiel opened an inn tap room (tavern) on the north side of Pearl Street, just south of Broad Street. He became prosperous and bought more property in New Amsterdam, but later tired of city life. In January 1658, he returned to Pavonia and raised a large number of cattle, continuing to become wealthy. He was named one of the first magistrates of the first court of justice within the present state of New Jersey. He and Fitje had nine children, all born in New Netherlands. He died in 1663, shortly before the English took over in June, renaming the area "New York." Fitje continued to manage the considerable estate that was left to her, and in her selling and trading was considered an excellent business woman until her death in 1697, whereupon she left all her lands to her seven surviving children. Ahnentafel #2368 - Hartman Michielsen VREELAND (1651 - 1707) - born in New Netherlands; married Maritje (Mary) BRAECKE (1652 - c. 1724) in 1672. They had 12 children, 10 of whom survived childhood. Ahnentafel #1184 - Claes Hartmansen VREELAND (1675 - 1757) - married Annetje Harmanse (1674 - 1698) in 1697. She was my ancestor. After her death, he married Elsje Pieters HESSELSE (b. 1675) about 1699, and had eight children. Ahnentafel #592 - Hartman Klaes VREELAND (1698 - 1760) - the only child of his father and his first wife; married Jannetje Jacobus (b. 1710) in 1733. They had nine children. Ahnentafel #296 - Johannes "John" Hartmans VREELAND (1733 - 1803) - married Judith "Judy" [--?--] (dates unknown). They had three known children. He died in Pequannock Twp., Morris Co., New Jersey. Ahnentafel #148 - Hartman VREELAND (c. 1767 - 1826) - married Elizabeth VAN DUYNE (1770 - 1862). They had six children. Ahnentafel #74 - John P. VREELAND (1799 - 1870) - married Mary KANOUSE (1804 - aft. 1870) on 31 May 1827 in Montville, Bergen Co., New Jersey. They had eight children. John was the first Vreeland of my line to move out of New Jersey and head west. He and Mary did so about 1841, with the oldest six of their children. They settled in York Twp., Washtenaw Co., Michigan, where he was a farmer. Ahnentafel #37 - Elenor "Nellie" L. VREELAND (1835 - 1912) - born in New Jersey, she moved with her parents as a child to Washtenaw County, where she met and married John Wallace LEWIS, Sr. (1839 - 1908) in 1867. He was a widow with two young children, and a Civil War veteran. They had seven more children, five of whom lived to adulthood. Nellie died at the home of her daughter and son-in-law in Pontiac, Oakland Co., Michigan. Did your New Year's genealogy resolutions include learning something new or getting better at a skill? Webinars are a wonderful, inexpensive, and fun way to do so! “Webinar” is a term that evolved from “web-based seminar.” It is a virtual seminar, taking place live and online with a presenter and audience. The presenter and each member of the audience can be in a different location, connecting through the webinar program on the Internet. The audience can hear the presenter and submit questions and comments to him or her through either a chat (text-based) or voice feature. The benefits of webinars include cost, comfort, access, and archives. The cost of the webinar to members of the audience can range from free to approximately $100 per program. However, even with a fee-based webinar, it is cheaper than travel, lodging, and meals for a live conference. For the audience, there is definitely the advantage of comfort. One can attend while in one's pajamas, or head out to the deck (weather permitting) with a laptop! The access includes immediate answers to the participants' questions and comments from the presenter. Finally, some hosts allow access to archived webinars (in online video format) for further review, or for those who are unable to attend the live presentation time. Genealogy webinars are sponsored by genealogical businesses such as Ancestry, Legacy Family Tree, and Family Tree Magazine; genealogical and historical societies and professional groups such as the Illinois State Genealogical Society and the Association of Professional Genealogists; as well as individual professional genealogists and genealogy lecturers, including Michael John Neill and Thomas MacEntee. Like any conference, the content ranges from "how-to" presentations for software and other technology to educational programs about methodology, ethnic research, record collections, or local history. Pat-Richely Erickson (DearMYRT) created a blog, GeneaWebinars, to list all the genealogy webinars for one-stop each access and planning. Only the most recent post is listed on the main page. Click on the “older posts” link at the bottom of the article to view more listings of webinars, or click on the Calendar tab near the top of the page to see all the upcoming webinars in chronological order. Both free and fee-based webinars are included. Sign up for the webinar and pay your fee, if applicable. You will receive a confirmation email and may need to click on a link to verify. Note the date and time of the webinar. If you click on the Calendar tab at GeneaWebinars, then click on your course of choice, you'll notice a button in the lower right corner of the course description that says "+ Google Calendar." This feature will not only add it to your calendar, but you can then choose to have an email, pop-up, or text (SMS) reminder sent to you. Make sure your computer is not downloading or uploading data or updating software during a webinar. This may slow down or interrupt your course. Turn on the speakers or plug in your headphones/earphones. If you plan to use voice features, make sure your microphone is working. Have an actual or electronic notebook ready to keep notes and have a list of questions ready for the speaker. Go to the website or click on the webinar link in your email ten minutes before it begins. Enjoy the webinar! Download an archived copy if you are allowed to do so. Some webinars also have additional information (notes, maps, slides) that accompany them. If your schedule doesn’t allow you to watch live, make arrangements to watch it later (this may involve a fee). With major upcoming genealogical conferences like RootsTech, NGS, the Southern California Genealogical Society’s Jamboree, and FGS, be sure to check out their websites for live and archived webinars. Don’t forget non-genealogy webinars for courses that can enhance your research, such as the United State's National Archives website, the United Kingdom's National Archives website, history websites, and technology websites. Google the last two topics to find webinar sites for these. Don't forget to check out Cyndi’s List for many more links! The DEADMOND line is one on my children's paternal grandfather's side. 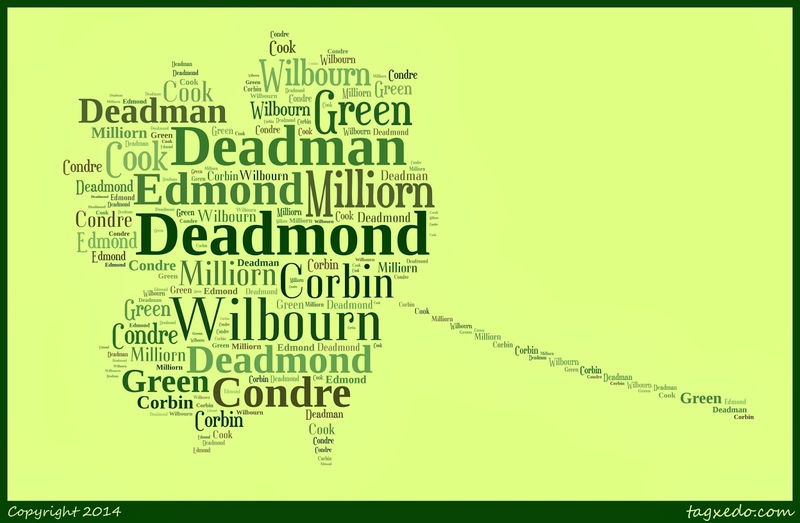 It is often spelled DEADMAN or DEDMAN in various documents and by the family members themselves. According to the Dictionary of American Family Names on Ancestry , the origin of the surname is unknown. It is possibly a variant of DEDMAN, itself a variant of DEBNAM. In turn, DEBNAM is a location surname for someone from Debenham in Suffolk, probably derived from the Old English river name "Deope" (deep one) and "ham" (homestead). The known DEADMOND story begins in Suffolk, England. Several generations emigrated to Maryland, a safe haven for Catholics. While I currently have not researched their religious heritage, I may venture to guess that this was a pull factor for this family. Ahentafel #8960 - John Lane DEADMAN, I (1596 - c.1679) - born in Cavendish, Suffolk, England, John married Sarah COOK (1595 - c. 1678) in 1612 in Marsh Parish, Suffolk, England. They had six known children. The family emigrated to Patapsco, Baltimore Co., Maryland, where both John and Sarah died. Ahentafel #4480 - John Lane DEADMAN, II (1613 - c.1689) - the eldest known child of John and Sarah, he was born in Cavendish, Suffolk, England and married Rachelle CONDRE' (1611 - c. 1690) in 1631 in Marsh Parish, Suffolk, England. She had been born in Roeun, Normandy, France. They had nine known children. Sometime after 1636, the family emigrated to Patapsco, Baltimore Co., Maryland, where both John and Rachelle died. Ahentafel #2240 - John Lane DEADMAN, III (1632 - c.1695) - another eldest child, he was born in Cavendish, Suffolk, England, and married Mary [--?--] (c. 1639 - c. 1697) about 1652 in Norfolk, England. She had been born in Roeun, Normandy, France. They had six known children and also emigrated to Patapsco, Baltimore Co., Maryland, where they both later died. Ahentafel #1120 - Thomas Charles DEADMAN (c. 1656 - c.1720) - a second son and child, he was the last of this direct family line to be born in Cavendish, Suffolk, England. About 1679, he married Margaret [--?--] (c. 1664 - 1749) in Patapsco, Baltimore Co., Maryland, her birthplace. They also had six known children and appear to have lived in Patapsco for the rest of their lives. Ahentafel #560 - Thomas James DEADMAN (c. 1687 - c.1771) - the youngest child, he was born in Patapsco, Baltimore Co., Maryland. In 1719 in Anne Arundel Co., Maryland, he married Sarah EDMOND (c. 1701 - c. 1781) who had been born in Reading, Middlesex Co., Massachusetts. They also had six known children. Thomas died in Davie Co., North Carolina, while Sarah died in Patapsco. Ahentafel #280 - Edmond DEADMAN (1724 - c.1812) - born in St. Paul's Parish, Baltimore Co., Maryland. In 1753 in Patapsco, Baltimore Co., Maryland, he married Elizabeth CORBIN (1734 - c. 1810) of Baltimore County. They also had ten known children and by 1778 had emigrated to Rowan Co., North Carolina, where they both died. Ahentafel #140 - William Lane DEADMAN (c. 1760 - 1837) - born in St. James's Parish, Baltimore Co., Maryland. In 1783 in South Reading, Middlesex Co., Massachusetts (his wife's birthplace), he married Mary GREEN (1757 - c. 1855). They also had four known children and died in Rowan Co., North Carolina. Ahentafel #70 - Thomas DEADMOND (1784 - 1851) - born in Mocksville, Rowan (now Davie) Co., North Carolina. In 1808 in Bedford Co., Virginia (his wife's birthplace), he married Elizabeth MILLIORN (1793 - 1862). They had eleven known children and emigrated to Marion Co., Illinois after 1810, where they died. Ahentafel #35 - Martha Susan DEADMOND (1813 - 1906) - born in Bedford Co., Virginia. In 1831 in Marion Co., Illinois, she married Dr. John Wilks WILBOURN (1809 - 1878). They had nine known children and emigrated to Northeast Texas about 1846/7, John dying Grayson County. After moving to neighboring Cooke County, Martha later emigrated with several of her adult children to Butte Co., California, where she died and is buried in Chico. Ahnentafel #17 - Mary Emeline WILBOURN (1839 - 1923) - I've written about her on this blog here. Ahnentafel #8 - John Franklin MIDKIFF, I (1870 - 1926) was married twice. He had four children with his first wife and three with his second. His daughter from his first marriage married his second wife's brother, making their children double and half cousins with my father-in-law! Ahnentafel #4 - John Franklin MIDKIFF, II (1910 - 1957) - I've written a bit about John on this blog in one of my best posts, "Every Eleven Miles." Postcard to Mr. and Mrs. [George] Rice Westaby [II] in Forsyth, Montana from T. S. Leland in unknown location, no date, stamp or postage cancellation, probably hand-delivered. Westaby-Lerfald Postcard Collection. Privately held by Troy Midkiff, [ADDRESS FOR PRIVATE USE,] Vancouver, Washington. 2014.